Get your space suits ready and head over to the #ViberUniverse Halloween Ball at The Palace Manila on October 31, 2016. All extra-terrestrials are being called back into the mothership as The Palace gets transformed into the solar system’s hotspots. Watch Pool Club turn into the moon, Valkyrie shift into a space station, and Revel go red for Mars. Our beat commanders, DJs Ace Ramos and Mars Miranda, will transport you to another dimension. 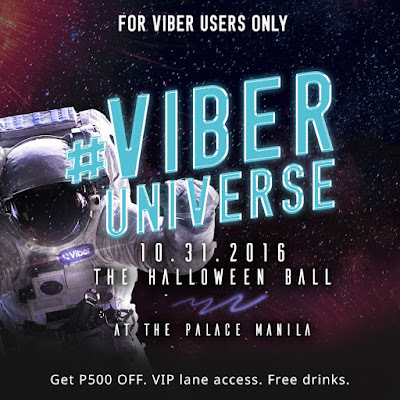 Viber users get exclusive treats at Manila’s biggest Halloween ball. Get your Viber ready and show your app at the Valkyrie entrance to get P500 OFF on entry tickets and to access the Viber lane for faster entry. Download and present the #ViberYourCrazy Sticker Pack to enter Pool Club, get a drink, and access the Planet Viber VIP Lounge—all for FREE. Go to www.viber.com/stickers/viberyourcrazy to get the free stickers. More surprises await Viber users at #ViberUniverse. All you need to do is use the hashtag #ViberUniverse and tag @ViberPH in all your social posts during this galactic evening.